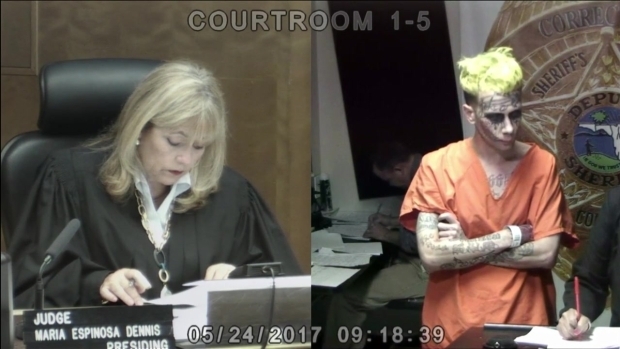 A man who looks like the joker spoke to NBC 6 about the gun charges he faces. 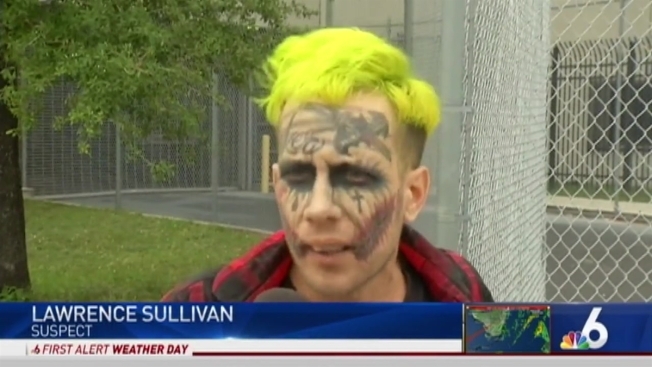 A Miami man whose green hair and tattoos bear a striking resemblance to the Joker character from "The Dark Knight" was arrested after police said he was pointing a loaded gun at passing cars. Lawrence Patrick Sullivan, 29, was arrested Tuesday night on a charge of carrying a concealed firearm, Miami-Dade police said. Sullivan was arrested after an officer responded to the 15200 block of Southwest 104th Street for a report of a man with green hair and tattoos on his face who was pointing a gun at passing vehicles, the report said. The officer spotted Sullivan walking out of the front gates of the Hammocks Place Apartments. He patted Sullivan down and found the firearm, a Smith & Wesson handgun with six rounds in the magazine, in Sullivan's pocket, the report said. At one point Sullivan told the officer "I don't have a permit cause it's too expensive," the report said. He spoke to NBC 6 after he bonded out of jail, disputing the charges. "The gun's in my name, it's not a dirty gun. Why they gonna charge me with a felony?" Sullivan said. When the reporter answered, "But, you don't have a permit," Sullivan yelled, "F**ck the permit. We live in America." Sullivan, who was listed as a "tattoo model" on the arrest report, was booked into jail where he was being held on $5,000 bond Wednesday, jail records showed. He later bonded out. Attorney information wasn't immediately available. Sullivan told NBC 6 cameras that he was in the psych ward at the jail. "I had my own cell. It was good, it wasn't bad," Sullivan explained. He added that he was treated like a celebrity while behind bars. Lawrence Patrick Sullivan, who bears a resemblance to the Joker, appears in bond court on a charge of carrying a concealed weapon. 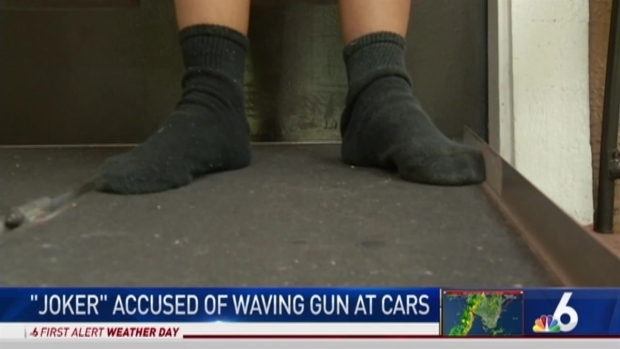 "I don't believe he was waving a gun around in traffic, he wouldn't do that. Yes he had a gun, but he wouldn't wave it around," said Sullivan's sister, who didn't want to give her name. "He's a character, he's just playing a character. I warned him that people would take it the wrong way."